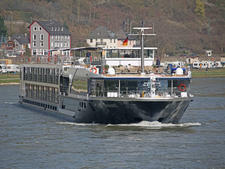 Avalon Poetry II is one of the smallest of Avalon Waterways' suite ships. The 128-passenger vessel launched in 2014 along with suite ships Avalon Illumination and Avalon Impression, but it's a full 82 feet shorter than most of the ships in its class. 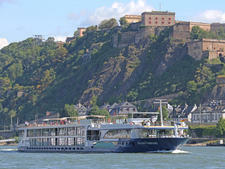 Poetry II does have sister ships -- Visionary and Artistry II, launched in 2012 and 2013, respectively -- and will sail the Rhine with them for one season before moving to France to sail the Rhone and Saone Rivers. The size difference between the smaller twins and the rest of Avalon's suite class of ship is most evident in two areas: the number of staterooms onboard (nearly 20 fewer) and the smaller square footage of the ships' forward lounge and dining room. Despite its smaller stature, Poetry II features the same innovative design in its cabins and forward social spaces that have become Avalon's signature. Avalon's panorama suites boast retractable windowed walls known as open-air balconies or French balconies, which are arguably the biggest sell for these ships. The innovative design allows 11-by-7-foot panoramic sliding-glass doors to open up the accommodations. Apart from the breezy views, though, a secondary benefit to these cabins is the added square footage. Tacking on the space that would be used for a balcony inside the stateroom means that panorama suites measure 200 square feet, larger than the industry average. Avalon has also opted to drop the prow section of its ships slightly, creating an interesting split-level design that creates both cozy nooks and a pleasing sense of spaciousness, particularly on the ship's third deck and upper deck. If you look down the third floor stateroom corridor, for example, the view opens from a narrow passage to the expanse of the reception and main lounge. The split-level top deck has the same effect, making the ships feel longer than they are, while also creating two separate spaces -- one full of loungers for sun-seekers and one full of tables for those who want to chat or read a book. The lower decks, too, feel tucked away. Only three decks can fit in the dropped prow, so the dining room is positioned midway between the bottom and middle decks, and it's much closer to the waterline than on most river cruise ships. Avalon has much to offer in addition to these signature designs, particularly in decor and dining. Cabins are comfortably furnished, with memory foam mattress toppers and plush pillows and duvets. Flat-screen televisions offer a plethora of options (including nine fireplace settings), and spacious bathrooms feature marble countertops, glass shower doors and L'Occitane bath products. Breakfast and lunch are both served buffet-style, but the quality of available fare is notably high. Dinners are superb, and whether you're adventurous or prefer to stick to the "always available" menu, you'll find something tasty. 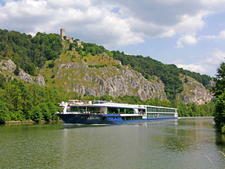 Finally, cruises on Poetry II are port-intensive, so they're great for anyone who enjoys European history and sightseeing. And, unlike sailings on mega-ships, most shore excursions -- and wine and beer at lunch and dinner -- are included in the pricing. 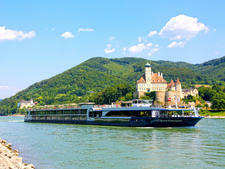 The average age for river cruise passengers is 60 and older, and passengers tend to be well-traveled. According to Avalon, more than 60 percent of passengers are from North America, about one-quarter are from Australia or New Zealand, and 8 to 10 percent come from the U.K. English is the language spoken onboard. The dress code for all sailings is listed as casual, which generally means nice trousers and collared shirts or blouses. Jeans are acceptable on shore excursions, and comfortable shoes are a must, as you'll be doing a lot of walking over uneven terrain. There are no formal nights, but passengers do tend to dress up a bit more for the captain's welcome and farewell dinners -- jackets (no ties) for men, and dresses or skirts or pants with blouses for women. 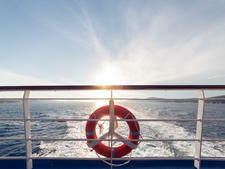 The euro is the onboard currency. 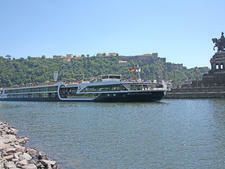 The line recommends 3 euros per passenger, per day, for the cruise director and 12 euros per person, per day, to be divided among the crew (including room stewards, waiters, chefs and other folks behind the scenes). You may also want to give local guides and shore excursion bus drivers a tip, so be sure to have some small denominations on hand. 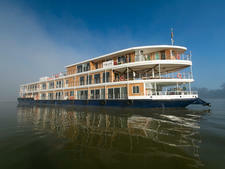 A cruise on Avalon Myanmar is as much about the itinerary as the boat itself, which was purpose built to sail the Irrawaddy River in Myanmar (Burma). 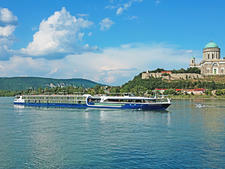 Suite ship Avalon Imagery II debuted in 2017 and with only 128 passengers, is small enough to access lesser-known ports and towns on the Rhine. 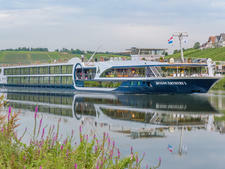 Launched in 2015, the 128-passenger Avalon Tapestry II is one of Avalon Waterways' "Suite Ships," a term that reflects the company's pride in its all-suite accommodation. 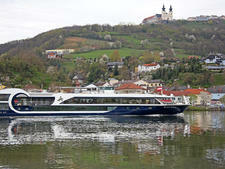 The 128-passenger Avalon Artistry II will join the Avalon Waterways fleet of river cruise ships in 2013. One of the lines Suite Ships, Avalon Artistry II features 52 suites, at least 200 square ft.
One of Avalon Waterways' all-suite ships, Avalon Tranquility II features two full decks of suites with wall-to-wall sliding windows that create an open-air balcony with seating for six. 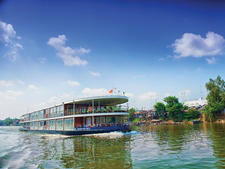 This four-deck river boat features 66 suites, a sky deck with a whirlpool and open-air bistro, multiple lounges, a small fitness center and free Wi-Fi. Avalon Impression has 83 cabins, three lounges, a whirlpool and games area on the Sun Deck, a fitness center, hair salon and two dining venues. With its newest "Suite Ship," the 166-passenger Passion, Avalon rises to the occasion with an experience that's modern, but still familiar and relaxing. 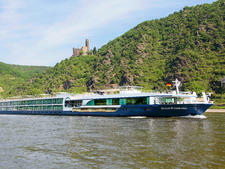 The 166-passenger Avalon Vista is a "Suite Ship." Vista also features all the classic riverboat accouterments, including a top-deck whirlpool, bow-to-stern Wi-Fi and spacious sun deck dotted with loungers. 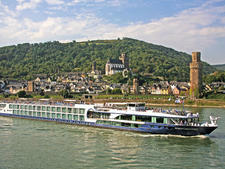 Avalon Creativity is part of Avalon's Scenery-class of 140-passenger ships, and cruises along France's Seine River. 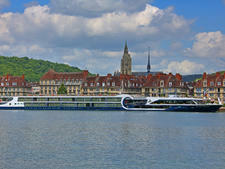 Avalon Visionary, is one of Avalon Waterways' "Suite Ships." It is the sister ship to Imagery II, Tapestry II, Tranquillity II, Poetry II and Artisty II. 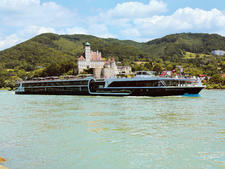 Avalon Waterways' 164-passenger Avalon Illumination, part of the line's "suite ship" class, offers roomy cabins, multiple lounges and contemporary chic design. Avalon Panorama offers 17 172-square-foot deluxe cabins outfitted with standard windows that offer limited views (read: no open-air balconies) and two 300-square-foot Royal Suites with panoramic windows. 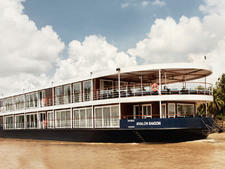 Avalon's second ship on the Mekong River has the line's signature award-winning cabins on a smaller vessel. The latest in Avalon's successful line of Suite Ships, Avalon Envision features two decks of Panorama Suites and plenty of active options on Europe's rivers.